During our trips back home to Kenya we always try and have a mini break in Diani, the south coast of Mombasa, and this time we chose Swahili Beach, a luxury 5 star hotel, as our chosen venue to relax and unwind on a half board basis. 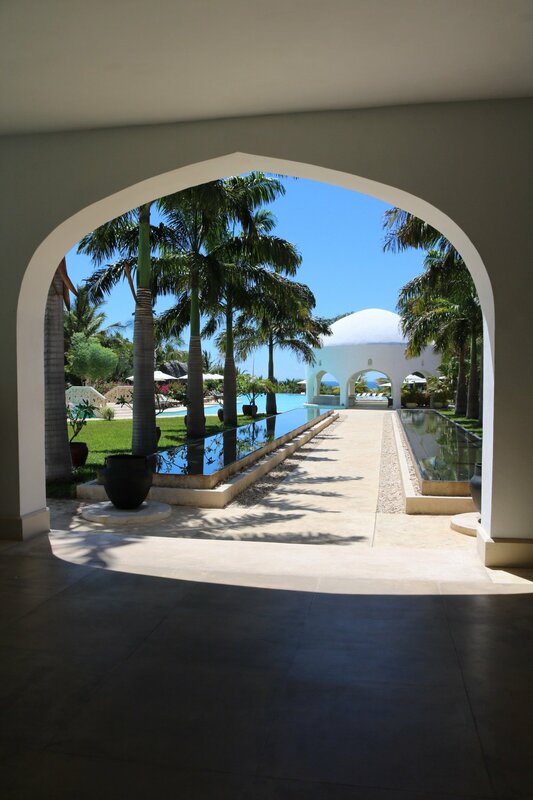 Swahili Beach has a unique look and designed with a traditional Swahili and Arabic architectural flair which is characterised by the use of arches, high ceilings, stone and pale colours. I love this design and find it has a charm of its own. Everything is so spacious and open and tranquil. The decor is all deliciously Swahili and beautiful. The resort itself is extensive with 7 cascading pools, gorgeous gardens and set on the beach with a view of the Indian Ocean. I have to highlight that it is not the most beautiful stretch of beach in Diani but it is still lovely and peaceful. There are various areas across the resort with ample sun loungers and chairs to relax in and there is also a coffee lounge, where afternoon tea is served daily, and a beach bar and restaurant, which is really nice. Upon arrival we were given refreshing Dawas, which are a popular Kenyan cocktail, to cool down with in the intense heat. This was a lovely gesture and check in was really smooth, quick and seamless. The staff were really welcoming and friendly. At Swahili Beach they have three categories of rooms – standard, superior and Executive. We were upgraded to the Executive suite, which was MASSIVE. It had its own lounge area, bedroom, ginormous bathroom and impressive balcony. There was a view of the pool area palm fringed with the coconut trees I adore! The balcony was so difficult to capture in one shot but here is a series of shots so you get an idea! The bathroom had a dreamy sunken bath as well as a separate shower and had a stunning design. The room had a large TV, desk, ample mirrors and plugs in convenient spots, hairdryer, eco friendly toiletries as well as air conditioning and a fan. The wifi was good and the room was clean and extremely comfortable. We had no complaints about anything. There were lots of choices with a lot of African and Indian dishes as well as classic continental ones. As we were on a half board basis, we decided to have lunch at the beachside restaurant Barharini, which was really nice. The sound of the waves whilst eating your lunch is one of my favourite ways to eat al fresco. For dinner we dined at the buffet restaurant, Majilis, which means meeting place. There was a really good selection, especially for vegetarians as one of our party was a vegetarian. It was a special occasion and the hotel pulled out all the stops to make it special so we were very happy and grateful for that. Breakfast, also in the Majilis, had an incredible spread of fresh fruits, juices, cold meats, cheeses, pastries, cereals, eggs, hot food and also some Kenyan specials. The Kahawa Lounge, where we had our afternoon tea, serves coffees and teas, and at tea time you can have pancakes, bhajias, cakes, and other delicious treats. This is complimentary. The cocktails were really good at Swahili Beach too! The mojitos kept me refreshed and happy. The Dawas were delicious too! If you fancied it, you could also have fresh madafu (coconuts). I adored this little table that signposted this. The hotel also has a seafood restaurant and an Indian restaurant, but we didn’t get a chance to try these out. The service at the hotel was really good. The staff were really attentive without being intrusive and quick at helping or taking food and drink orders. The pool was my favourite feature of the hotel, and I had a fantastic time swimming and sunbathing by the pool. The hotel was very quiet when we stayed so we had most of the pool to ourselves. The hotel also has a spa but I didn’t get a chance to try it out. Swahili Beach is located on Diani Beach. The beach is really relaxing and peaceful but I wouldn’t say it is the best stretch of beach you can find in Diani, having stayed at other hotels at the South Coast. However, it is still a really decent stretch of beach and there are nice comfortable lounge chairs to chill in. Overall we really enjoyed our stay at Swahili Beach. It was really good value for money when comparing rates at other hotels (March 2017) and the service, food, room and overall experience was wonderful and we would recommend it. For more information about Swahili Beach visit their website. Looks stunning, and that beach! The terrace is excellent – we stayed somewhere in the desert with space like that too and it was excellent as it meant you didn’t have to leave your room to relax and have space!